Friday night was the fourth edition of the quarterly event in Ludington called Story on Stage. These are hosted by the Ludington Visiting Writers and Ludington Area Center for the Arts. Three short stories were read, with musical numbers by local artists in between. The stories were "The Day Before Easter" by Liesel Litzenburger, "Gar Fishing," by Sarah Jane Smith, and "My Urologist, My Psychologist," by George Dila. The last one was of great interest to the West Side Gang (our local writer support group), because George is a regular member and one of our facilitators. His story is from his recently published anthology, called Nothing More to Tell. As you can see, the theme of the refreshments carried out the celebration of George's publication. The book is published by Mayapple Press. 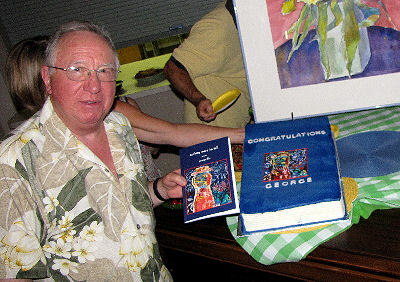 That's George in the picture, with his book and his cake, which was exceedingly yummy! We were all really happy to see one of our own be published. It's his second collection of short stories, The End of the World was published by Pure Heart Press in 2008. How do I feel about Story on Stage? The readers do an excellent job, and it's fun being part of something live such as this. This time, in fact, two of the readers, Natalie Ross and Phil Gigante, are "Earphone" award-winning readers who are probably familiar to audiobook listeners. The stories were well-written, with lots of great imagery and taking us inside the narrator-character. However, I wish the story selection was more diverse. So far, all ten stories I've heard at these events are of the "life is a sad enigma" genre. I get plenty of that in real life, and long for some variety in the presentations. I'm not sure I can take many more of this style without a break.